It's one of the most basic problems facing the study of sexual reproduction: sperm are just too tiny, too numerous, and too similar-looking to be studied individually. But that's changing — thanks to glow in the dark sperm. 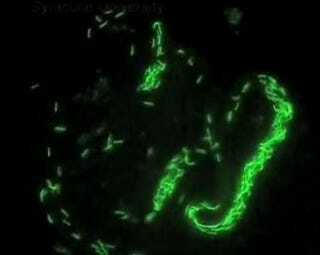 Researchers at Syracuse University were able to alter fruit flies genetically, so that their sperm would glow either green or red. They accomplished this by making the heads of the sperm fluorescent. This is particularly useful in fruit flies because females mate with more than one male at a time, and so the newly fluorescent sperm allows the biologists to tell which sperm comes from which father. "It's a difficult field site. And sperm are tough to watch, you can't tell different sperm apart. And so that's really held progress back, in terms of understanding the devil in the details of how post-copulatory sexual selection works."